Ok, so some kind of blog update is WAAAAAY overdue. So much has been happening over the last few months, I’ve barely had time to sit down at the computer before we’re up to some new adventure. 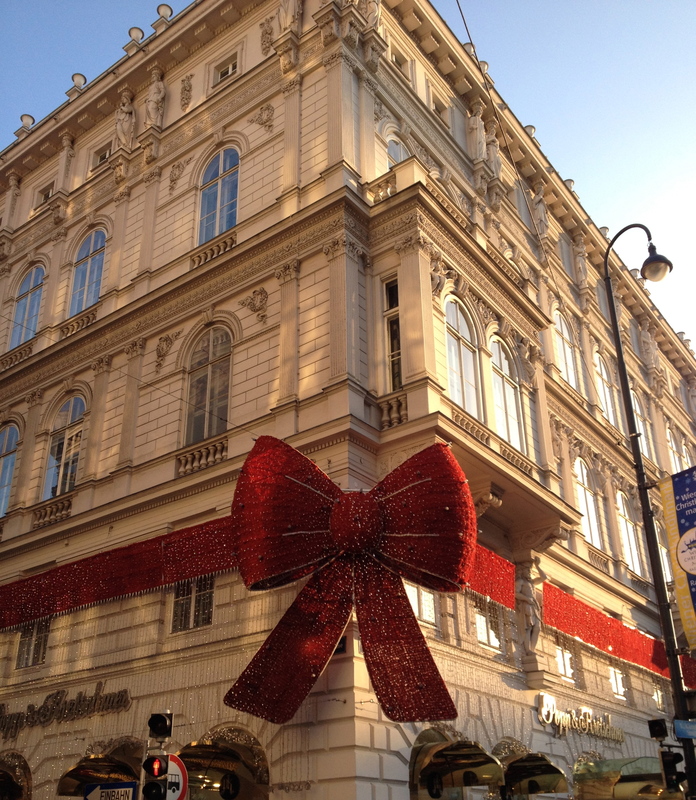 I will try to catch up by the end of summer, beginning with today’s post about a family visit to Vienna last December. I know, ancient history, but here goes. While on our way back to Toronto to visit with our families this past Christmas we decided to stop over at a European city that none of us had ever visited before, as a reward for all our hard labours at work and school during the autumn. 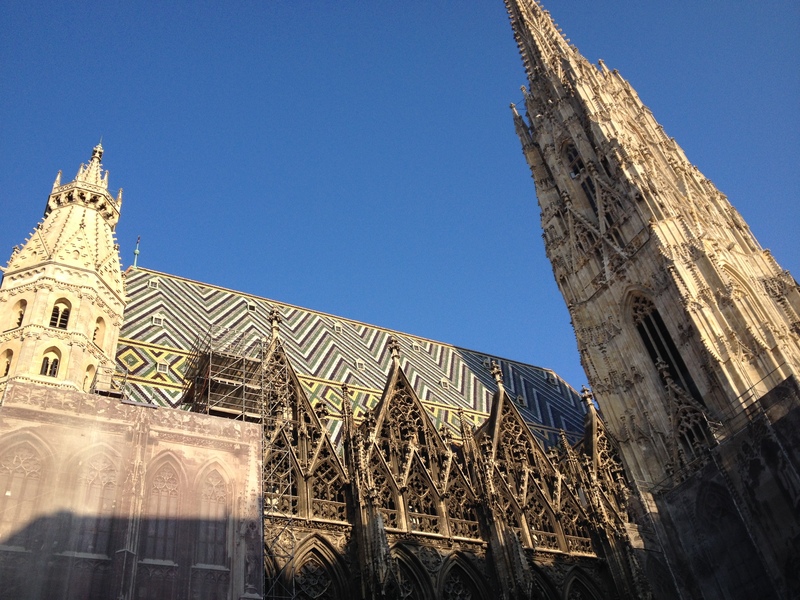 While there were a number of tempting candidates, Vienna, Austria was top on our list. What better time to visit this charming, Old World city than when it is decked out with Christmas lights and decorations, and the public squares are filled with people enjoying the centuries-old tradition of the annual Christmas markets? Vienna, or Wien in German (pronounced “Veen”), is the capital of Austria and straddles the Danube river in the eastern end of the country, close to Austria’s borders with the Czech Republic, Slovakia and Hungary. 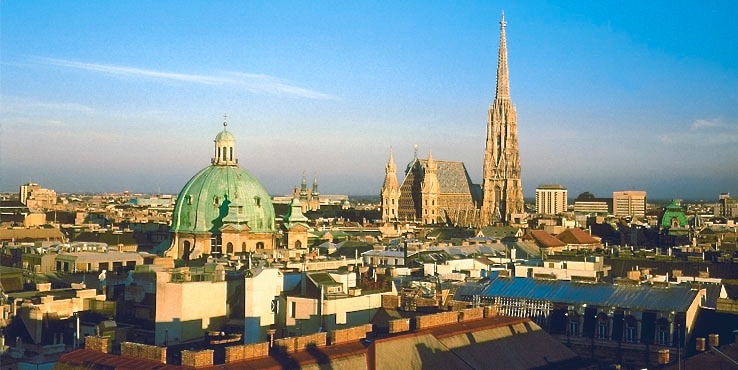 Vienna has a rich history as an imperial city of central and eastern Europe, firstly within the Holy Roman Empire and, subsequently, as the de facto capital of the Austro-Hungarian Empire of the 19th century. Lying near the crossroads between East and West, Vienna twice fended off attacks from the Ottoman Turks in the 16th and 17th centuries. 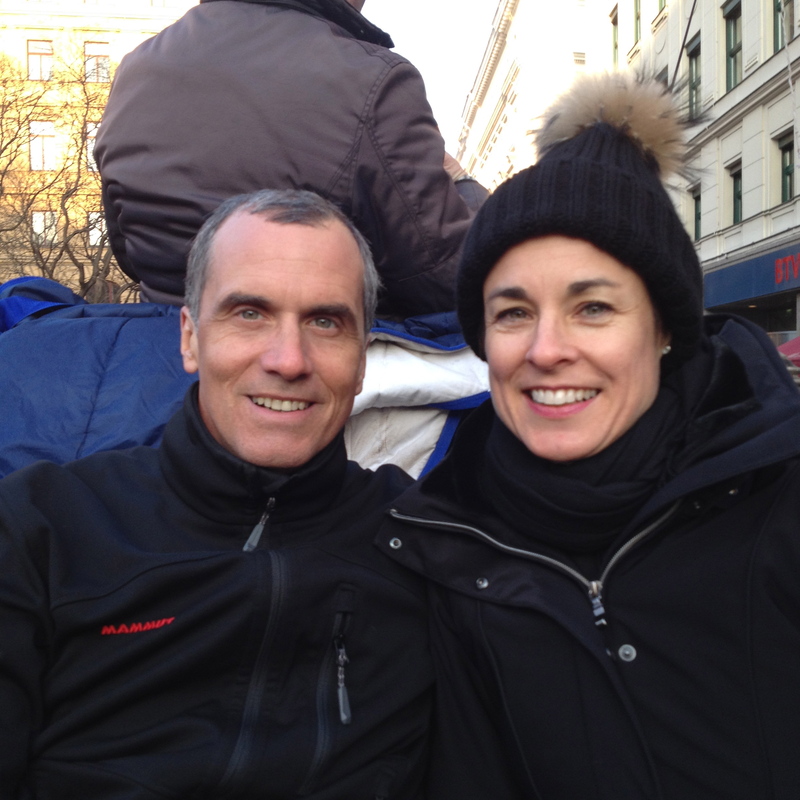 Kathryn and I bundled up for a horse and buggy ride through Vienna. 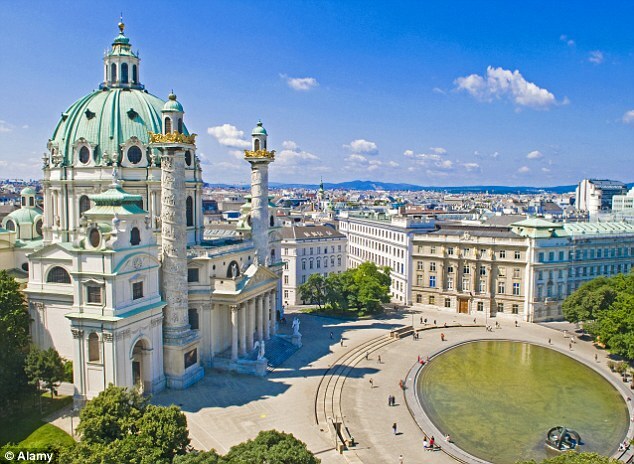 Vienna’s role as the imperial seat of the Hapsburg dynasty and the Austro-Hungarian Empire is reflected in the grandeur and richness of its architecture. The city is filled with Baroque palaces, churches, cathedrals, music recital halls and public gardens. It also has some fine Art Nouveau buildings. Among the more popular buildings to visit are the Hofburg, Belvedere and Schonbrunn palaces, the Stephansdom cathedral, the Votivekirche, the Art Nouveau Secession building, the State Opera House, and the expressionistic, anti-modernist Hundertwasserhaus. Most of the city’s historic buildings are contained within or lie along the city’s famous Ringstrasse, a 5.3 km ring road that encircles the old city. Built in the late 19th century in place of the old city’s fortification walls, the Ringstrasse is a broad, tree-lined boulevard that is one of the great streets of Europe. Vienna has long been one of Europe’s intellectual, artistic and culinary centres as well. Among the city’s most famous thinkers are the philosopher, Ludwig Wittgenstein, and the founder of pychoanalysis, Sigmund Freud. Influential modernist artists (Gustav Klimt) and architects (Adolf Loos) also called Vienna home. 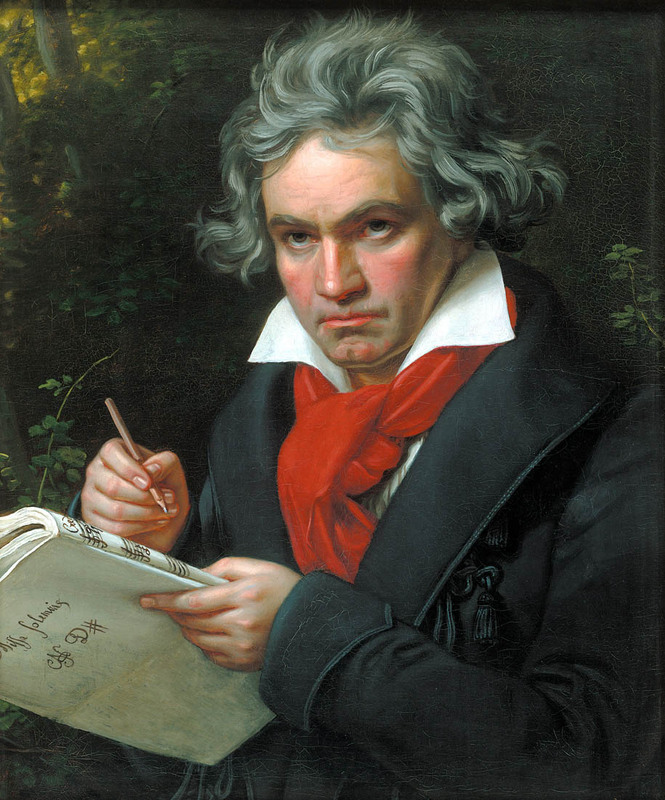 Without question, however, Vienna’s greatest legacy to western art is in the field of classical music. Among the world’s great classical musicians and composers who called Vienna home at one time or another are Mozart, Beethoven, Strauss, Hayden, Mahler, Schubert, Brahms, Shoenberg, and Berg, among others. Vienna’s culinary influence is considerable as well. While justly famous as the birthplace of Austria’s national dish, Wiener Schnitzel, Vienna is best known for its pastries and desserts, including Apfelstrudl (apple strudel) and Sachertorte. So influential is the Viennese tradition of pastry-making that in many parts of Europe desserts are simply called “les Viennoise”. 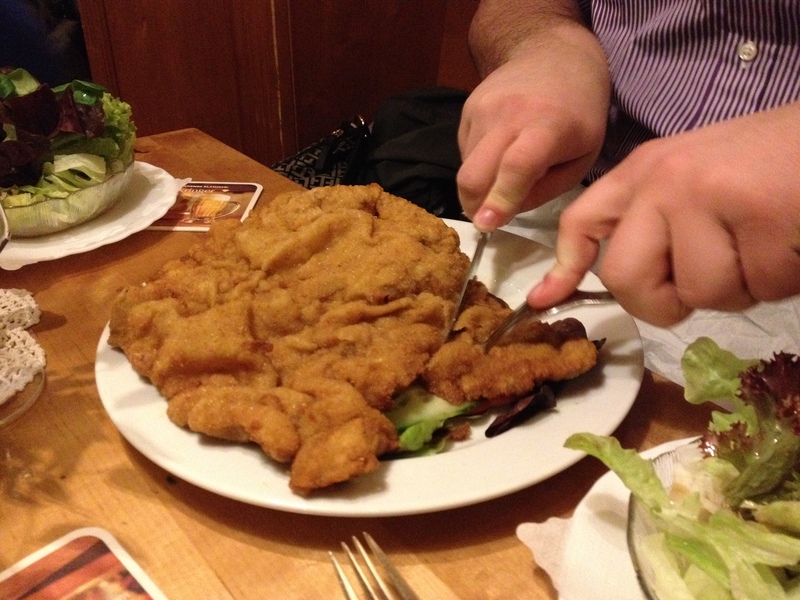 Tucking into a Wiener schnitzel the size of a dinner plate, literally! With all of this to appreciate in just 3 days, we wasted no time in hitting the streets to explore the old city as soon as we arrived on a Thursday afternoon. What follows are some highlights and impressions from our visit. First of all, much of each day was spent wandering the streets of the old city while moving between museums, palaces, shopping venues, cafes and restaurants. As expected, the streets and shop windows of the old city were festooned with Christmas lights and decorations, which really came alive at night. We were also struck by how walkable and human the old city was in scale, as compared to other grand cities such as Paris and London. Most of the major attractions within the Ringstrasse were within 20 minutes walking distance of one another, with good cafes conveniently located between them for refreshment stops and to escape the chill air. One of the many beautiful Christmas light displays around the city. One of our first destinations was the Belvedere Palaces, two spectacular Baroque palaces built in the early 18th century as a summer residence for the Hapsburg general Prince Eugene of Savoy, who turned back a Turkish invasion in 1683 (nice perk!). Now the home of the Austrian National Museum, the Upper Belvedere houses a permanent collection of paintings by renowned Austrian artists such as Gustav Klimt and his protege Egon Schiele, as well as works by foreign masters including Monet and Jacques-Louis Davide. 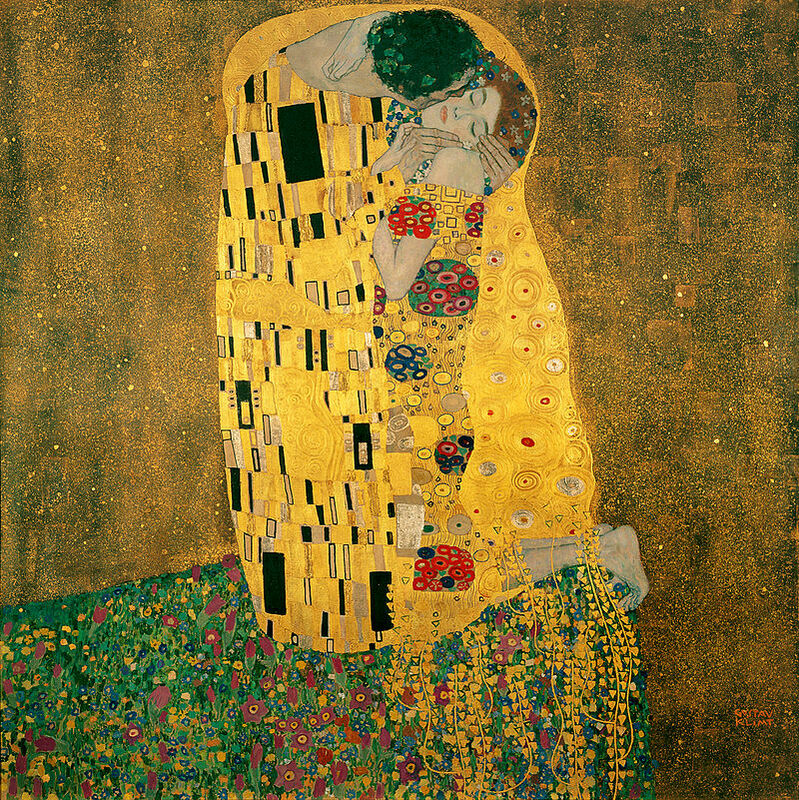 A special room is set aside for a handful of works by Klimt, in particular, including his most famous work, The Kiss, which he painted in 1909. Another day we took in the Hofburg Palace, historical residence of the Hapsburg monarchs, which today houses the offices of the Austrian President, as well as state rooms, museums, and the Austrian National Library. Among the exhibits and museums we explored were the Imperial Apartments of Emperor Franz Josef (1830-1916) and his wife Princess Elisabeth (aka “Sisi”). Along with a series of lavish state rooms and apartments (apparently kept as they were during Franz Josef’s reign), the museum displays the imperial silverware, gold table decorations, and porcelain plates and serving dishes used during imperial state functions. Room after room filled with lavish dinnerware, including gold candelabras and serving platters. It was all a little obscene after a while, but you have to admire the craftsmanship. Gold table service used for state functions. Another wing displays the private effects and apartments of Sisi, adored (supposedly) by her subjects at the time, and still the subject of fascination and admiration among Austrians today. Sisi is credited with contributing to much of her husband’s success as a ruler, but she later became a reclusive, tragic figure who suffered bouts of depression after the suicide of their son Prince Rudolph. 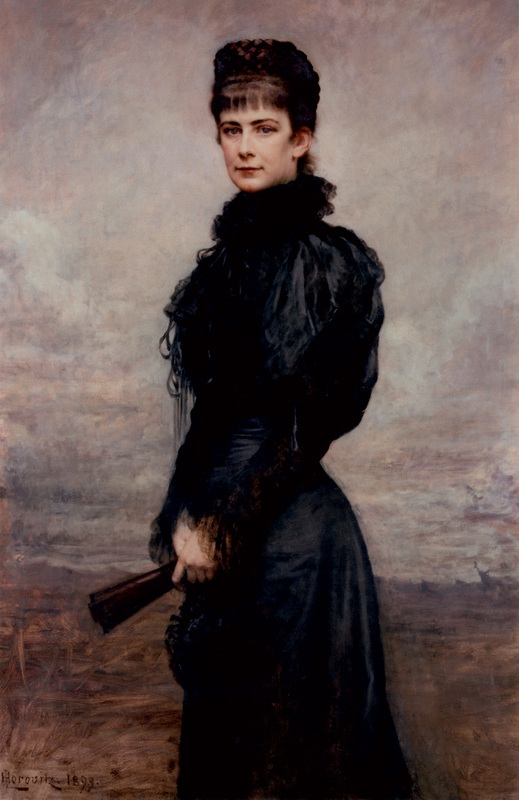 Henceforth dressed always in black and seldom appearing in public, she became obsessive about her looks and adopted a strict regimen of fasting and physical training. Her public, meanwhile, became increasingly fascinated by her infrequent appearances, paying minute attention to her wardrobe, state of mind, and her health; anticipating by decades the cult of celebrity that enveloped female movie and TV stars of the 20th century. Her assassination in 1898 by an Italian anarchist, moments after stepping off a ferry in Geneva, only added to her tragic mystique. By far our favourite wing of the Hofburg Palace was the Austrian National Library, a grand old library with 100ft high ceilings, massive wood-paneled bookcases, marble floors, and a lovely cupola in the ceiling. The rooms were filled with dusty tomes, large globes, and other historical memorabilia. It makes a powerful impression when you first walk in, like entering a St Peter’s Basillica devoted to the book. The incredible interior of the Austrian National Library. The other palace building we visited was the Baroque era winter practice hall of the Spanish Riding School, built in 1735, which houses the famous Lipizzaner stallions, descendents of Spanish-bred horses first brought to the Austrian court in 1580! The equestrian school here has a history dating back almost 450 years. Today the School’s 72 stallions and 20 riders undergo strict training in dressage and perform regularly for visitors and tourists. Granted, the building and the horses are beautiful, but unless one has an appreciation of the finer points of dressage steps, such as the “piaffe” and the “travers”, I would skip the pricey show that the School puts on. We found it tedious within the first 30 minutes of a 90 minute show. 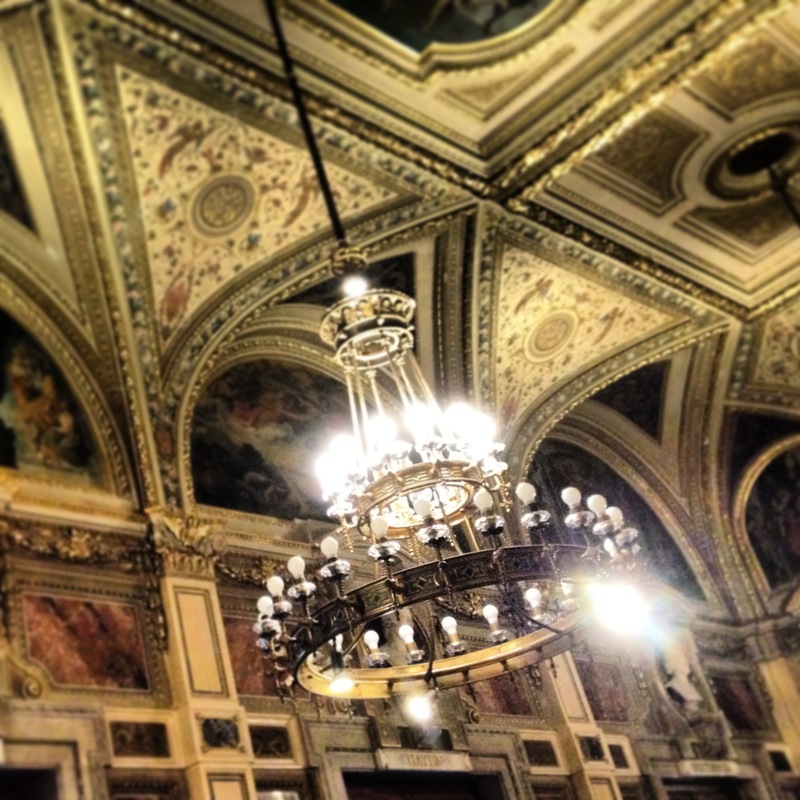 Another building worth visiting is the State Opera House , or Staatsoper. This lavish opera house was originally built in the mid-19th century and is filled with grand marble staircases, ornate decor, and beautiful chandeliers. One of the hundreds of chandeliers in the Staatsoper. In addition to visiting the main auditorium, which seats over 2000 and is lined with deluxe box seats, we got a sneak peak backstage where a crew was grappling with the massive sets for a production of Wagner’s Tristan and Isolde. The one unpleasant aspect of a trip to the Staatsoper is having to navigate through the throng of aggressive ticket-hawkers outside who sell tickets to a bewildering array of various musical performances around the city, none of which take place in the Staatsoper itself. What a nuisance they are! 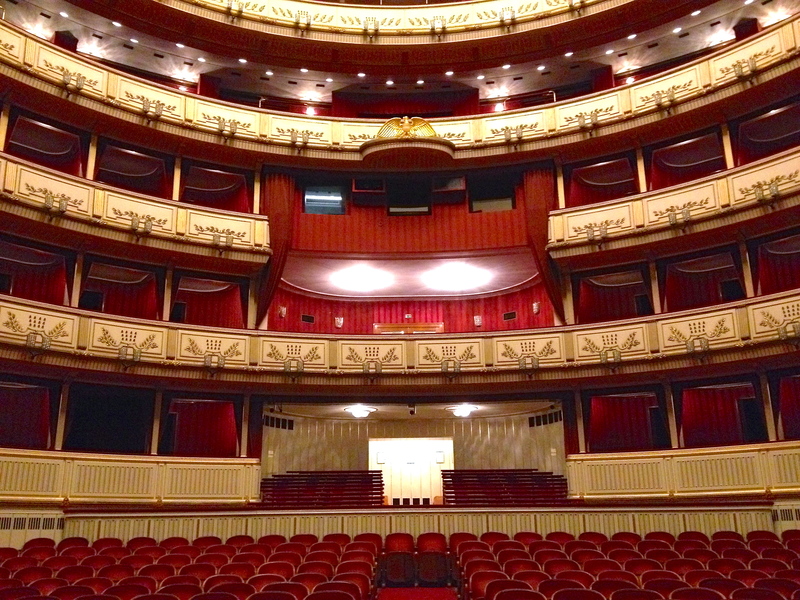 Box seats at the Staatsoper. Another lovely building is the Musikverein, a lavish 19th century concert hall that is home to the Vienna Philharmonic. We took in a concert by a string ensemble one evening in the lovely Brahms hall. 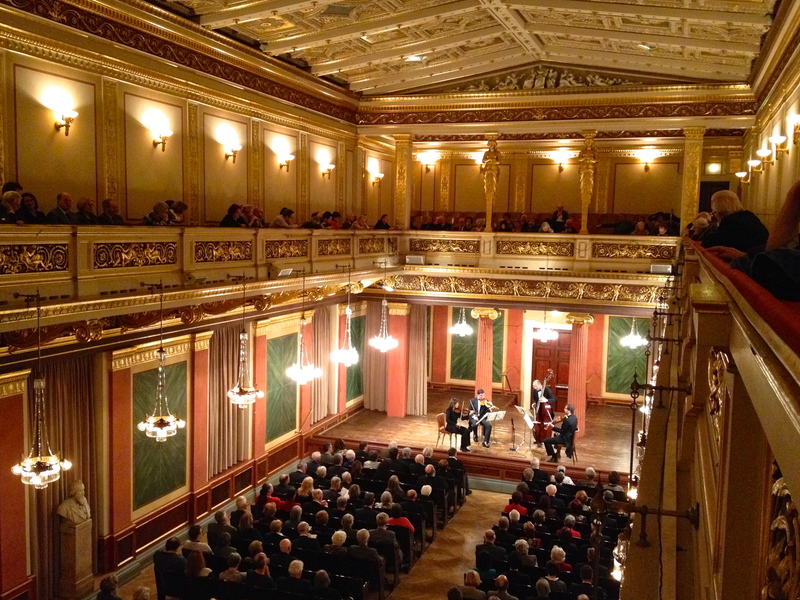 A string ensemble performs at the Musikverein. Another day we focused on visiting the living quarters of two famous Vienna residents: Wolfgang Amadeus Mozart and Sigmund Freud. Located in the heart of the old town, the Mozarthaus consists of a museum dedicated to the famous musician and composer, one that incorporates a series of rooms in which Mozart and his family lived from 1784 until 1787. Mozart lived in Vienna from 1781 until his untimely death in 1791, working as a freelance performer and composing on commission. It was during his years in Vienna that he produced some of his best known works, including the operas The Marriage of Figaro, Don Giovanni and The Magic Flute. There is an interesting museum here with lots of interesting artifacts, including musical scores, period clothing, and Mozart’s death mask. None of the original furnishings from his apartment remain, however, so it takes some imagination to picture he and his family in the 4-room apartment that visitors can walk through. 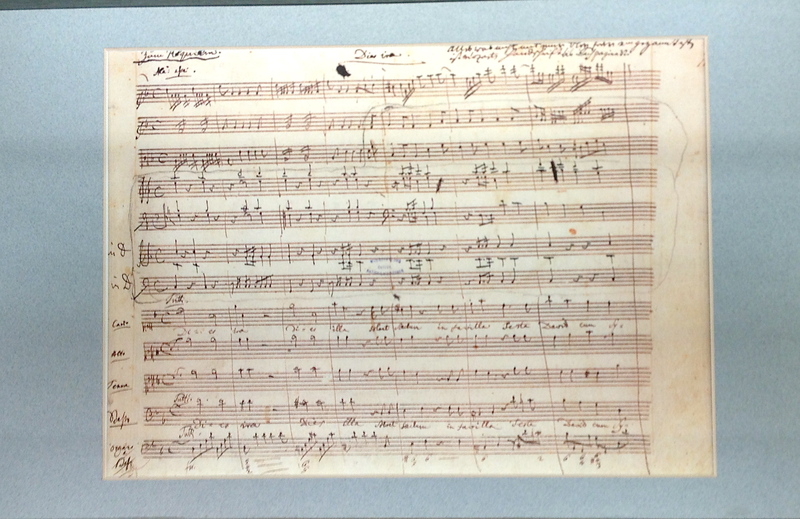 A draft of one of Mozart’s musical scores. 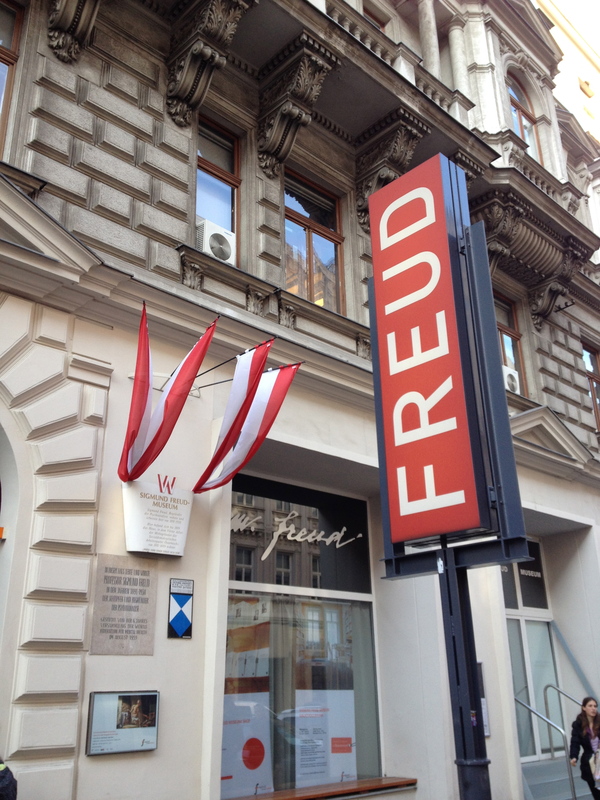 On the outskirts of the old town, near the Ringstrasse, we also visited the Sigmund Freud Museum. A large rowhouse at Berggasse 19 is where the founder of psychoanalysis lived and practiced from 1891, until he and his family were forced to flee Nazi persecution in 1938. The Sigmund Freud Museum at Berggasse 19. Beginning in the 1970s the family apartment, waiting rooms, and office began to be restored with some original furnishings from the family, and it has now become a fully-fledged museum, research institute and exhibition space. It was strange to sit in the same room where once sat patients such as “Wolfman” and “Ratman,” waiting for their regular sessions with Doctor Freud. 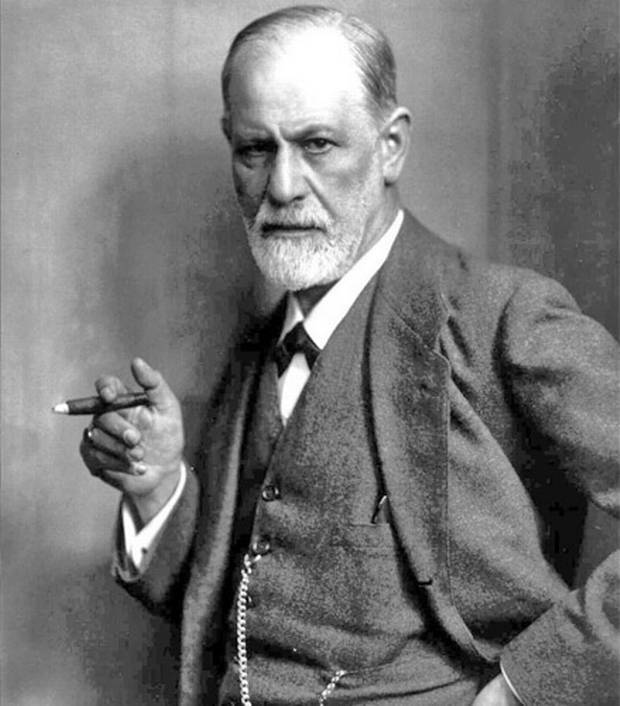 Sadly, however, few of the original office furnishings remain, most notably Freud’s famous couch, which still sits in the London home where he lived in exile after leaving Vienna, and which is now a museum as well. 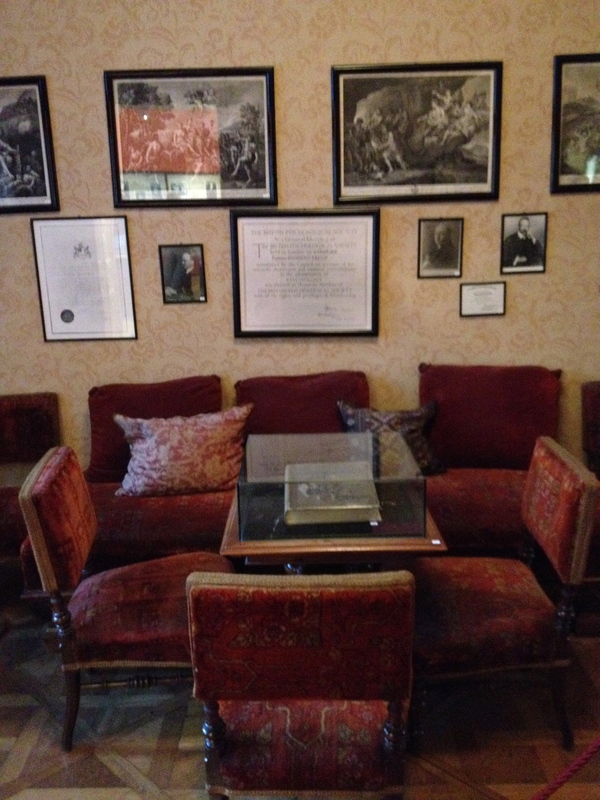 The waiting room, more or less as it was during Freud’s time here. Also on display at the museum at the time of our visit was a series of very intimate photographs of the late British painter, Lucien Freud, at work in his studio. 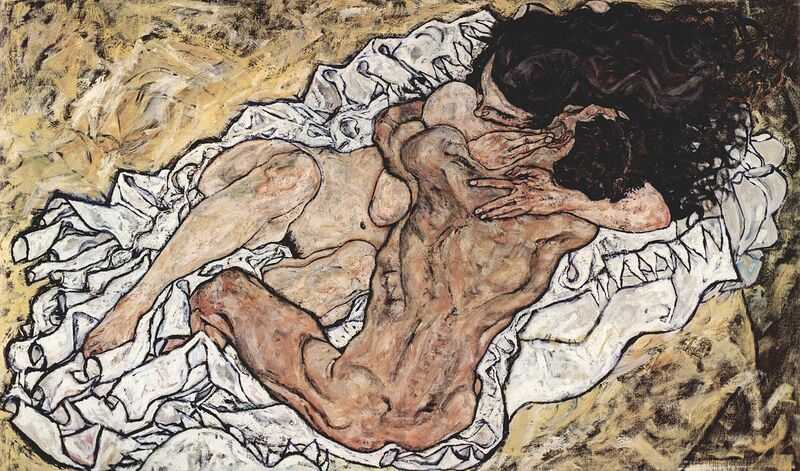 The latter Freud, who was Sigmund Freud’s grandson, was one of the UK’s most celebrated artists of the 20th century. He died in 2011 at the age of 88. Photograph of Lucien Freud at work. All of the walking and museum visits made us hungry and thirsty, of course. Thankfully, Vienna is blessed with some amazing coffee houses where delicious refreshments and snacks are readily available, served up with a dose of history. Unlike most North American and even some European cities, Starbucks has a very low-profile presence here. Instead one finds a host of traditional cafes serving coffee, light meals and, of course, desserts. Usually housed in some ornate, historic building, the traditional Viennese coffee house features plush seating, chandeliers, and efficient, crisply dressed waiters. The Cafe Central, frequented by Lenin, Trotsky, Freud and Hitler, among others. The bohemian coffee house of 19th and early 20th century Europe was an important social and political institution, where artists, intellectuals, and subversives gathered to argue, gossip and plot revolution. 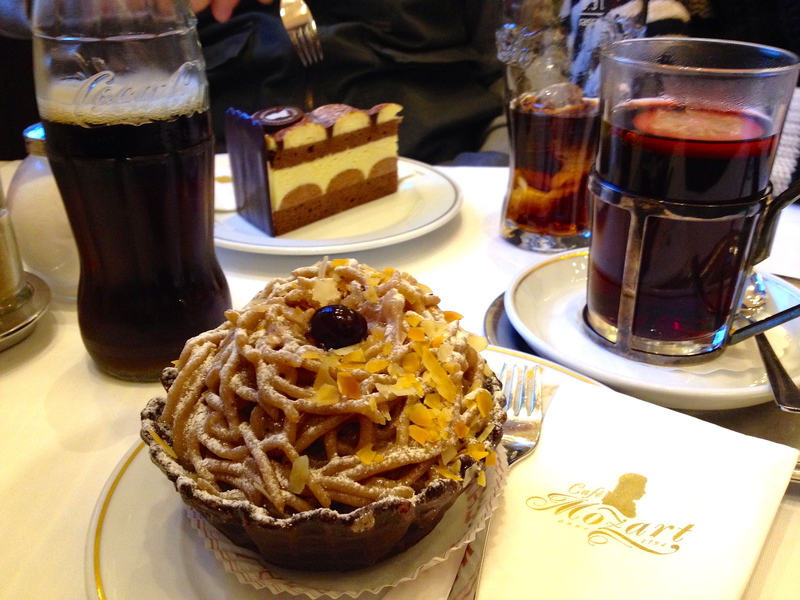 Vienna had as lively a coffee house culture as any European city and many of its most famous cafes from that period remain open today, including the Cafe Demel (1786) , Cafe Mozart (1794), and the Cafe Central (1876). The Cafe Central, for example, was a focal point for Europe’s artistic, intellectual and revolutionary elite in the early 20th century. In January 1913 alone the Cafe Central was patronized by Freud, Tito, Hitler, Lenin and Trotsky! Perhaps this suggests that the role of sugar and caffeine has been grossly underestimated as engines of history. We made sure to visit all three of these historic cafes during the course of our stay, although we didn’t plot anything more serious than where to eat dinner that night! Dessert case at Cafe Central. While Vienna has some fine cuisine to offer (including Wiener schnitzel the size of a dinner plate! 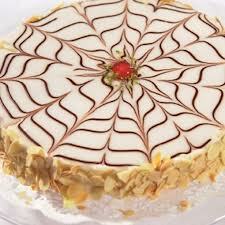 ), it’s all just a prelude to the main course – dessert!!! Vienna is home to some of the finest dessert creations in the world. Thanks to the intense competition among the bakers at the city’s coffee houses, there are dozens of different cakes and confections to fatten oneself on. 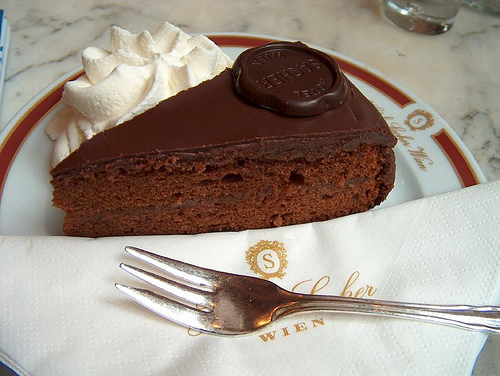 The grandaddy of them all is the famous Sachertorte (pronounced “zaccertortuh”), named after the baker, Franz Sacher (who developed the recipe for Austrian Prince Metternich back in 1832). The recipe has changed little since then: dense chocolate cake coated with a thin layer of apricot jam, then topped with dark chocolate icing and served with a dollop of “Schlagsahne” (whipped cream). Franz’s son Eduard opened the now 5-star Sacher Hotel in 1876, where the Sachertorte has been made by hand and served daily ever since. The Sacher Hotel was a little out of our snack bracket, so we settled for dessert and coffee at the lively cafe/bar attached to the hotel, where we all enjoyed a taste of this famous treat. 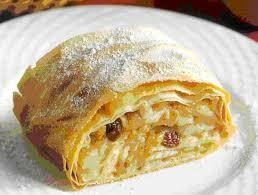 Among the more traditional desserts, the Viennese make incredible “Apfelstrudel” (apple strudel). “Strudel,” as it happens, means “whirlpool” or “vortex” in German, referring to the swirling layers of apple and dough one sees when a strudel is cut and served in cross sections. Thinly sliced apples, raisins, butter, lemon juice, apricot jam; these are the typical ingredients that go onto a thin pastry dough before it is rolled into a log to be baked and then cut into mouthwatering slabs … what’s not to love? Better yet, the Viennese like their strudel THICK; each piece comes 5-10cm high, more like a meal in itself rather than a dessert. Then there are the more exotic and eye-catching patisserie, including a host of multi-layered torte, such as the Esterhazy, Dobos, and Schwarzwalder varieties, many of which originated in Hungary. These confections feature half a dozen or more layers of sponge cake or pastry with layers of buttercream and/or jam in between, topped with colourful glazes with intricate patterns. One of the more unusual desserts I tried was something called “Gesztenyepure”, also known as a Mont Blanc. Served in a variety of ways, the Gesztenyepure consists primarily of a pile of what looks like whole wheat spaghetti noodles. After noticing this odd-looking dessert in a number of cafes I finally decided to give it a try. The “spaghetti”, it turns out, is made of sweetened chestnut puree (a staple of Austrian desserts that was borrowed from neighbouring Hungary), that are extruded in noodle form. I can’t say it was my favourite, but if you don’t like chocolate or anything too sweet, give it a try. Gesztenyepure and Gluhwein at the Cafe Mozart. 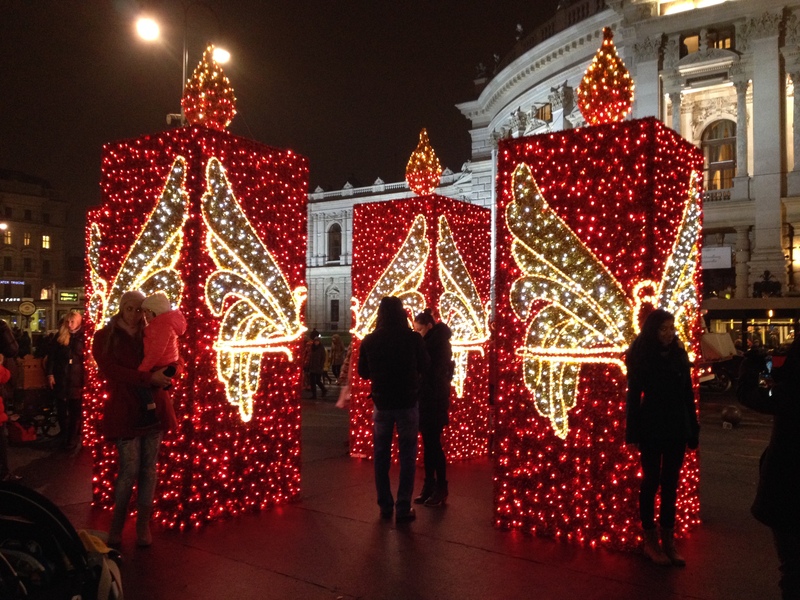 Saving the best for last, the most anticipated aspect of our stay in Vienna was visiting the city’s Christmas markets, or “Weihnachtsmarkten”. Christmas markets pop up in cities all over Europe in the weeks leading up to Christmas Day and are popular with residents and tourists alike. Usually located in public squares and parks, the markets feature dazzling lights and Christmas decorations and dozens if not hundreds of stalls selling handicrafts, baked goods, sausages and other local delicacies and, of course, cold beer and hot mulled wine (“gluhwein” in German, “vin chaud” in French). 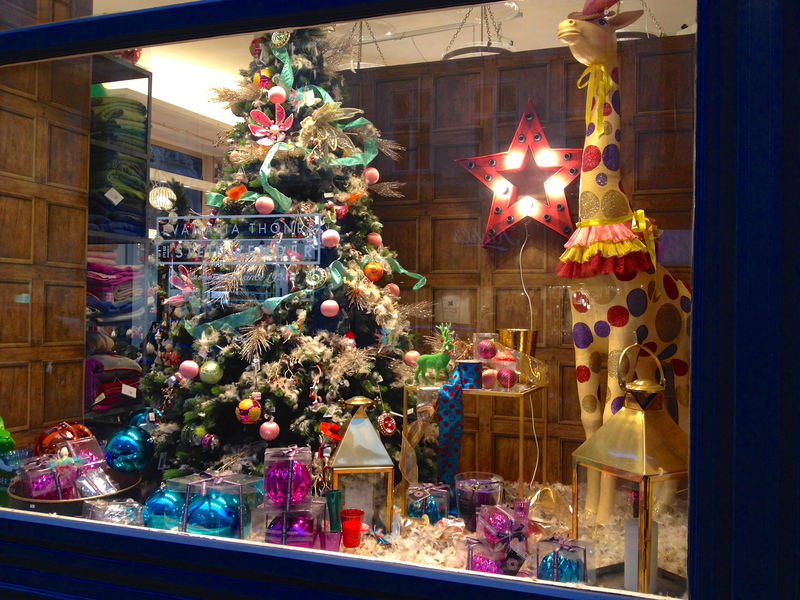 Normally open for a few hours each evening, the markets are a popular and festive place for crowds to gather. 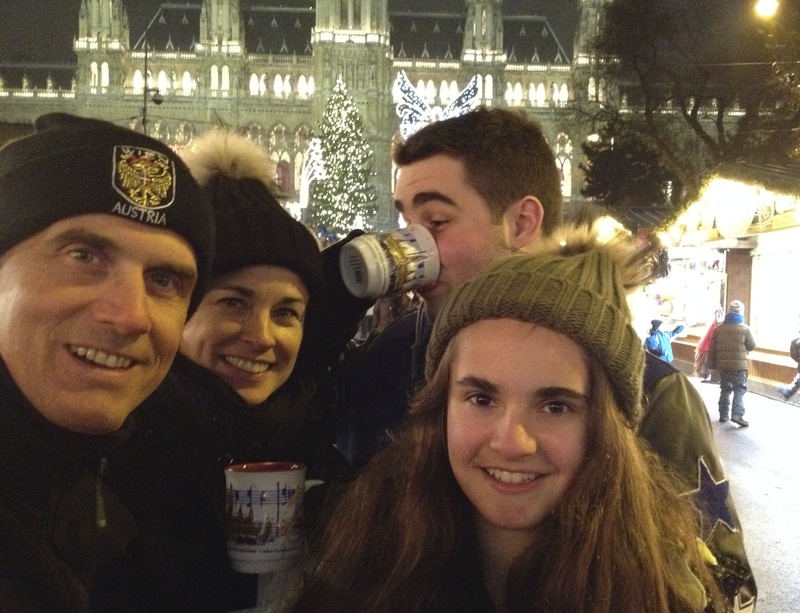 The Christmas market in front of the Rathaus (City Hall) in Vienna was our favourite. The tradition of the Christmas market has its roots in Germany, Austria and parts of France, where they were first held in the late Middle Ages. Cities such as Frankfurt, Munich, Nuremburg, Colmar and Strasburg have held markets for over 500 years. 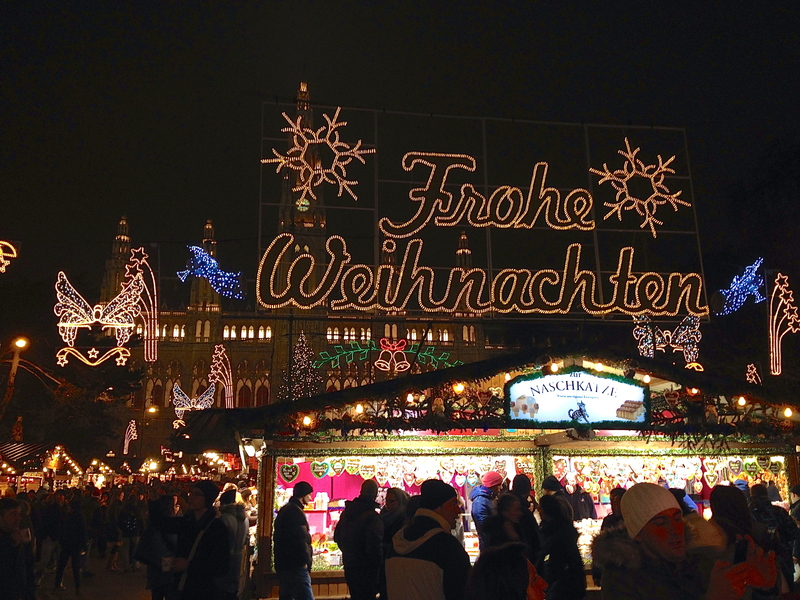 Vienna’s Weihnachtsmarkt is one of Europe’s oldest, with records of a “December market” dating back to 1294AD! Larger cities often host more than one market. In Vienna’s case, we had at least a half dozen to chose from and we made sure to sample 3 or 4 during our stay. Our favourites were the markets at the Karlskirche and the Rathaus (City Hall). We spent an hour or two most evenings wandering the stalls, picking up last minute Christmas gifts, while sampling the local bratwurst, gingerbread cookies, beer and gluhwein. The good markets were usually packed with people in a celebratory mood. Rubbing shoulders with the crowds was also a handy way of keeping warm from the cold breeze that seemed to blow through the city during most of our visit. And with that we concluded our whirlwind visit to Vienna. Already laiden with an extra pound or two around our waists (thanks to all the bratwurst and dessert), we carried on to Toronto to catch up with family and friends over the Christmas holiday, with little inkling of the cancelled flight, lost luggage, ice storm and power failure awaiting us, but that’s another story.